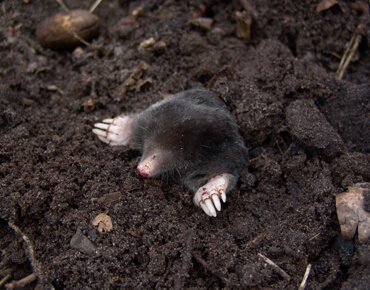 Moles frequently invade lawns and gardens in search of worms and other food sources. Rest assured they aren’t damaging your lawn just for fun – rather, they are establishing a set of tunnels in which to trap worms. Moles dislike noise, vibrations and strong smells. Some people recommend moth balls, but we have had mixed success with this method at best. Lawn & Weed Expert can treat your lawn to encourage the worms (which, remember, is what the moles are after) to burrow deeper and avoid the mole tunnels. With their food source gone, the moles should move away from your garden to hunt for sustenance elsewhere. Traps and poisons are not an effective long-term solution, although they can be profitable for mole catchers: in our experience, killing a mole results in another mole replacing it, and so on until their food source is gone! Once the moles have left your lawn, we recommend regular lawn maintenance to prevent them from coming back. Keeping your grass from getting too long will ensure that you can spot the signs of moles if they return to your lawn. If possible, don’t let your lawn get too soggy as worms (and thus moles) are attracted to wet earth. Need help with a mole problem? We can help to remove moles from your lawn – contact Lawn & Weed Expert today for advice.